The Protector series of plant floor computers and computer enclosures are built from the ground up for high performance in corrosive, dusty, wet, hot and cold environments. Protector plant floor computers and computer enclosures are at home in industries where ergonomics, maintenance, and sanitation are of highest priority: meat, poultry, and fish processing, food packaging, pharmaceuticals, and chemical production. Ideal when you need to put a PC into a harsh production environment. 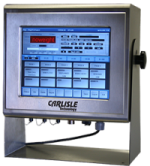 Carlisle’s, wash-down stainless steel enclosures protect small footprint PC from dust, moisture and sanitation processes. 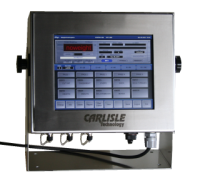 They feature a water-resistant 304 or 316 stainless steel enclosure, equipped with a bright high-resolution 17” or 22” display, quick disconnect serial and USB I/O options. Protect your hand held scanners with the optional scanner bay, or add a wash-down keyboard and mouse. Typical uses include: extending your mission-critical manufacturing or warehouse management applications to the plant such as ERP, MES, WMS, or legacy AS400 programs. The E-Series has glove-friendly touch screen support, and comes with either a 17" or 22" display. An internal UPS provides clean and reliable power. 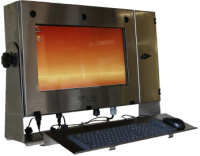 The E-Series has flexible I/O options and is a cost effective way to put a PC into a harsh environment. The M-Series is our newest additional to the Protector Family. This series comes standard with a 22" touch screen and is made up of all 316 Stainless Steel. The M-Series can be wall mounted or mounted on a pedestal stand.